Antioch residents have been rattled this week by a rash of paintball attacks across the East Bay city. More than half a dozen people have reported paintballs striking cars, houses and their bodies. Some are concerned it may be part of a troubling nationwide trend. Erin Billanow described the mess she’s had to clean up after somebody fired about 50 rounds of paintballs into her front yard. Billanow heard screaming and popping outside her door two nights ago. 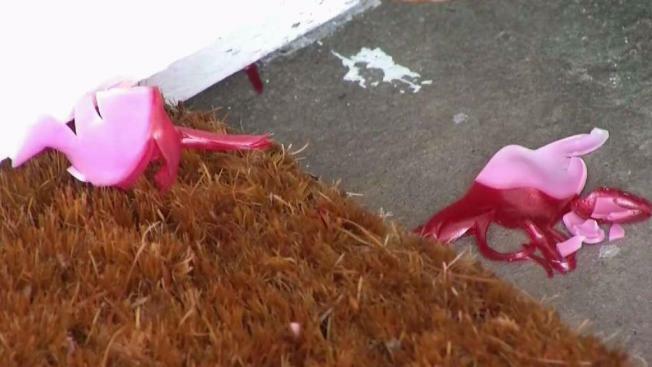 She found a woman claiming she’d come under fire and pink paint everywhere. "It was hot pink. It was all over the doorway," she said. "I kind of wondered if that’s a new thing. While we were waiting for police, if this is a new thing to do." At least a half-dozen others in Antioch also have been hit with splashes of color this week. Paintballers have been targeting houses, cars and people, prompting Antioch police to issue a warning that it’s not only illegal but also dangerous. Valerie Pastor and her sister had a close call. She was helping her sister unload groceries from their car in the driveway Wednesday afternoon when a passing car shot a paintball at them, barely missing her sister, who had just had surgery. Luckily, the paintball didn’t even burst. "It could have hit her in the hip or back or head," Pastor said. "It happens so fast, by the time you call police, they’re gone." The paintballers luck may be drying up, though. One victim captured the suspect’s car on surveillance video.